There’s been a lot of talk about speculation in the Vancouver real estate market. 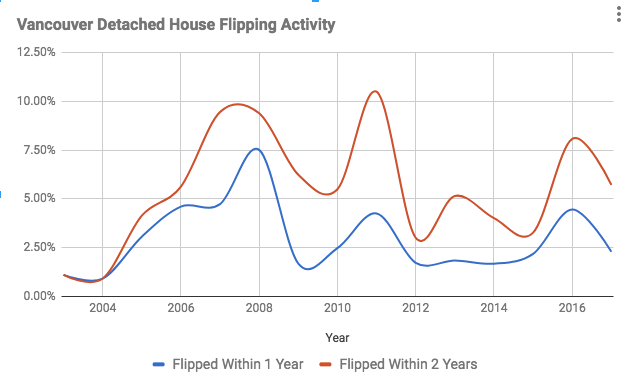 Thanks to the help of UBC economist Tom Davidoff, together we were able to track the amount of house flipping activity in the market. Before we analyze the numbers, it’s important to understand the difference between speculation and house flipping. Speculation is defined as “investment in stocks, property, or other ventures in the hope of gain but with the risk of loss.” One could argue this is what some Vancouver buyers do in order to justify current prices. House flipping on the other hand is a symptom of speculation, where a buyer buys and sells a home within a one year period. Sometimes upgrades and renovations are done, other times they simply hold and sell into a rising market for a quick profit. So far in 2017, 4.36% of Vancouver homes (condos, townhouses, and detached) have been flipped within one year. In 2016 that number was 4.13% and just 1.95% in 2015. House flipping has been steadily growing, but numbers are well off our 2007 record of 7.24%. You’ll also notice the number was high in 2008, 6.11%, which is likely a result of buyers quickly offloading properties as the market softened during the financial crisis. The percentage of Vancouver homes flipped within one year. Vancouver condos have seen an uptick in flipping activity this year, making up 4.98% of condo sales in 2017. This is up from 3.33% in 2016. This should come as little surprise since Vancouver condos are increasing by 2.2% per month right now. 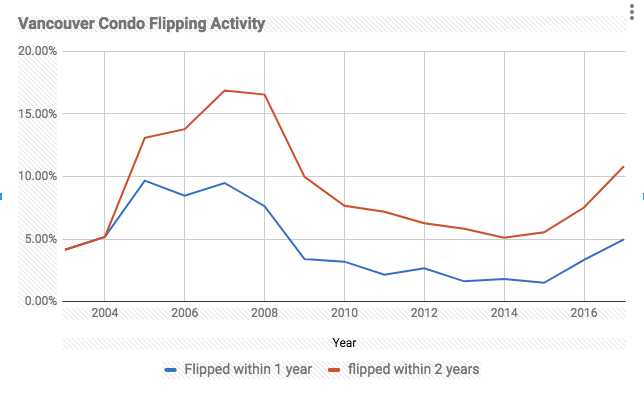 I’ve also included the percentage of condos flipped within two years, which currently sits at a staggering 10.82%. Percentage of Vancouver Condos Flipped. Vancouver detached house flipping has been nearly cut in half. In 2016, detached houses being flipped within one year made up 4.46% of sales, and reached 8.1% over a two year window. It has since dropped to 2.29% and 5.7% respectively. Again, notice the peak in 2008 as buyers appear to offload their assets. A bit of a surprise, but Vancouver townhouses are being flipped most frequently at 5.81% in 2017. This could be due to lower volume. Vancouver Townhouses being flipped the most. 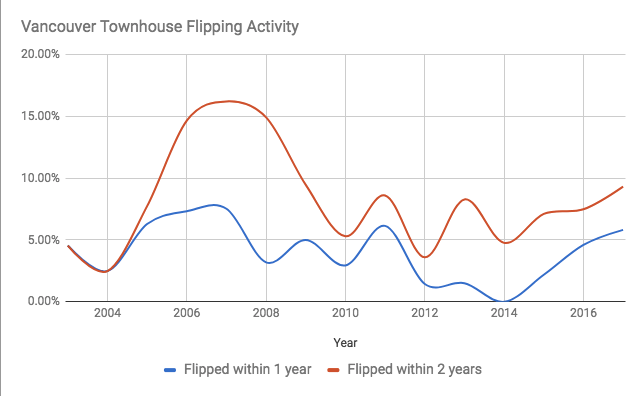 How Does Vancouver Flipping Compare Elsewhere? 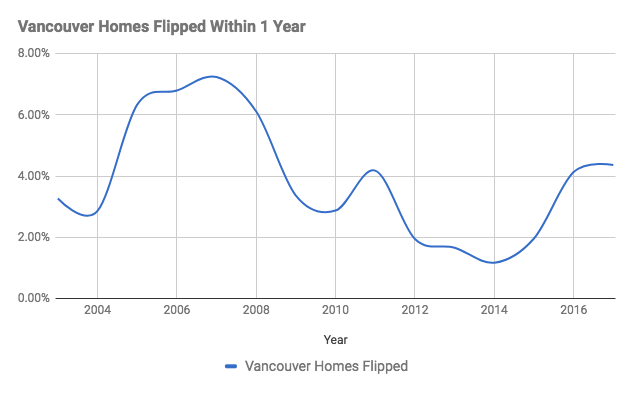 With the total number of homes being flipped in Vancouver at 4.36% it suggests there’s not nearly as much flipping as other heated markets such as Toronto, which saw a 7% turnover year over year. Further, home flipping in the United States was 6.1% for 2016, which suggests flipping homes might be more common in the south. To summarize, there’s been a clear shift towards buyers speculating on condos and townhouses. The number has been steadily growing as prices escalate, while detached homes appear to have peaked in 2016 as prices began cooling.